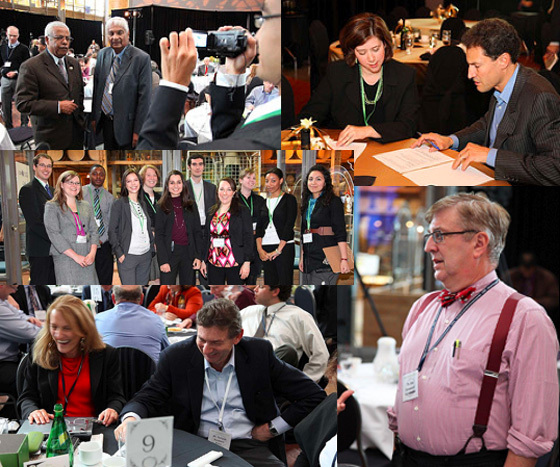 CIGI’ 09, the annual conference this year focused on – ‘Towards a Global New Deal,’ ended in the most relaxing way. After two days of intense presentations, discussions, and reflecting over the big global picture, the conference wound down with an opportunity to laugh and deal in a more lighthearted manner. We say ‘lighthearted’ because though the poll described in the press release below was an exercise conducted such a way that although attendees were serious about the content, the format allowed all to find consensus in the easiest of ways: there was much camaraderie reflecting the spirit of the Conference. We would like to thank Alison DeMuy for believing that co-bloggers would be just the right requirement for the Conference and having the insight to pair us up. We enjoyed this partnership and look forward to future collaborations. Anne Marie Sanchez worked her magic behind the scenes making sure that most of our wishes would come true. And then, Jason Shim, our go-to Internet wizard made it seamlessly happen. Finally, our gratitude to our colleagues who contributed their thoughts and enthusiasm and of course, you, who logged in, took time to read and join us in this adventure. Waterloo, Canada – October 4, 2009 – The United States and China will provide global economic leadership, said the participants of a poll conducted today by The Centre for International Governance Innovation (CIGI) during its annual global conference this weekend. For the poll, more than 200 conference participants were asked the question, “Who will provide economic leadership beyond the global economic crisis?” This question was posed during the final segment of the event, which was devoted to a brainstorming session, titled “Building a Global New Deal.” This participant-wide session was moderated by Steve Paikin, anchor and senior editor of The Agenda with Steve Paikin, TVO’s flagship current affairs program. The other poll findings offered insight into the bad habits that economic actors will have to give up as part of a global new deal, and the key elements for a sustainable global new deal. The moderated session was the concluding segment of the CIGI conference, Towards a Global New Deal, which brought together more than 200 accomplished global opinion leaders, researchers, policy makers, business executives, journalists and graduate students to examine the systemic impacts of the global economic crisis and define and debate issues of critical global importance, while identifying innovative practices that can assist in meeting global challenges. The two broad conference themes were: (1) The impact of the current global economic crisis on the evolution of various governance systems and (2) the future of global economic leadership.